After seeing Ubisoft's Michael Jackson The Experience demonstrated live on the Wii yesterday, I am overcome with emotions, from impressed to totally creeped out. What is Michael Jackson The Experience? 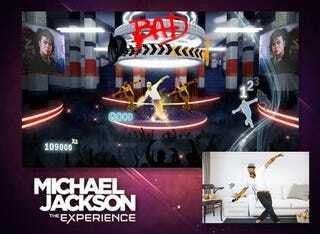 It's a dancing game for the Nintendo Wii, Xbox 360, and PlayStation Move, that capitalizes on each systems' unique motion control technology to let players dance and sing like the King of Pop himself. The Kinect and Move versions track your entire body. The Wii just tracks your Wii remote, and doesn't have a singing component. I watched an Ubisoft representative and a professional male dancer go through two routines on the Wii version of the game, and this is the way they made me feel. Impressed: I was impressed by the complexities of movement being captured by the Wii remote controller, almost as much as I was by the professional dancer pulling off difficult dance moves in combat boots. It looks like the developers have really nailed Jackson's range. Isolated: While the Wii version supports up to four players at a time, only one avatar appears on screen while you dance, that of the instructor, a mysterious figure that likes to dress as Michael Jackson. Progress is measured by four colored lines that slowly crawl up the corner of the screen. All of this technology at our fingertips, and four players have to be depicted by four colored lines? Creeped Out:It's only placeholder art, but it's pretty damn freaky. During the two songs I watched being performed, "Billie Jean" and the one I can't remember, a silhouette dressed in Jackson's clothing appeared center stage acting out the singer's be moves. The avatar is faceless and pale, and every once in awhile you can see the hint of dark eyes. During "Billie Jean" the screen freezes, simulating the video's effects. The face is frozen, and you can make out a darkened mouth lurking beneath the flesh, opened wide, and screaming. It was terrifying. And that's how I left Ubisoft's demonstration: Completely terrified. I'm pretty sure I had nightmares about it last night. The purpose of this game is to help share Michael Jackson's spirit with the world. Until that placeholder artwork is changed, all it will be doing is helping Jackson's spirit haunt our dreams.